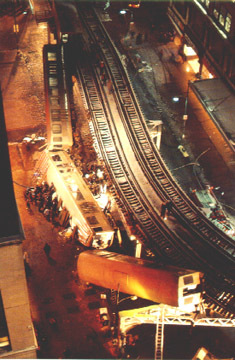 Perhaps the most remembered and most infamous "L" accident of recent memory is that which occurred on the curve at Wabash and Lake on the evening of February 4, 1977. Nothing quite like it had ever happened on the elevated and hasn't been repeated to this day: the unusual circumstances, the level of damage, the numbers injured and killed. 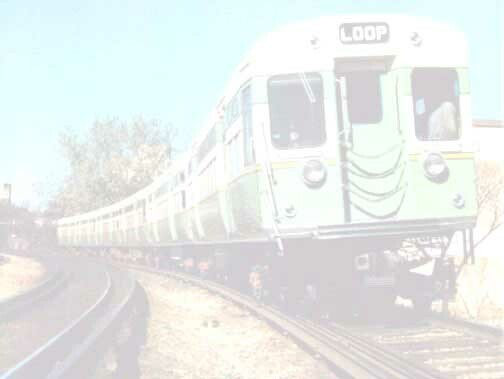 On this particular day, switching problems had caused Evanston Express trains to operate counterclockwise around the outer loop track instead of clockwise on the inner, as normal. The problem was corrected at approximately 5:10pm, but a few Evanston trains that had already begun their trip around the Loop were continuing to operate on the outer track. As can be imagined, the extra trains on the outer track caused some minor delays. At approximately 5:25pm, one such Evanston Express was loading and unloading passengers at the State/Lake station. A Ravenswood train was following and had stopped on the track behind the Evanston Express, waiting for the Evanston to clear the station so that it could pull in. At the same time, an Oak Park-bound Lake-Dan Ryan train was boarding and alighting riders at the Randolph/Wabash station, two blocks away and around the bend from State/Lake. The motorman of the Lake-Dan Ryan - one Stephan A. Martin, age 34, a motorman since 1969 - completed his station duties and pulled his train out of Randolph/Wabash. Somehow, it escaped his attention that there was a train stopped on the tracks ahead, although this information was being relayed to him both visually and audibly by the new automatic cab signaling system installed in his motor cab. He proceeded against the restrictive signal at a speed of less than 15mph (thus staying under signal control), around the Lake & Wabash curve, into collision with the stopped Ravenswood train at 5:27pm. Making matters worse, Martin continued to apply motor power, even after the collision! The 8-car Lake-Dan Ryan, with 2,500 kw of power behind it, pushed against the immovable Ravenswood train. This application of power, coupled with the fact that the train was on a 100 ft. radius elevated curve, caused the tubular coupling bar between the first and second cars to buckle, pushing the rear of the first car and the front of the second into the air. The first three cars were lifted sufficiently upwards and outwards that they jackknifed and crashed to the street below, the fourth car (still coupled to the rest of the train) hanging precariously between the elevated structure and the street below. The last four cars stayed on the tracks, still berthed at the Randolph/Wabash station platform. Barbara Coats, 35, a passenger in the first car of the Lake-Dan Ryan train, said after the accident, "It wasn't a big impact, but it was like we hit something and couldn't go any farther. After the front wheel went off, I was just praying we couldn't fall off - but we did." Ambulances and police rushed to the scene in minutes, the ambulances lining up on Lake Street waiting to move the dead and injured. Fire Commissioner Robert Quinn called an immediate extra alarm to hurry needed man power to the intersection, which was blocked by the wreckage. 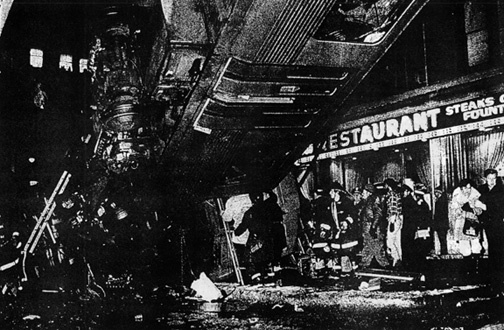 Police and firemen worked for two hours to free persons trapped in the wreckage, chopping holes in the tops of the elevated cars to extricate victims. Some people were treated on the street before being loaded into ambulances. Other were taken into nearby stores and restaurants, which were turned into makeshift infirmaries. Joining the city departments already at the scene were Mayor Michael Bilandic and Cardinal Cody, who, along with other priests, administered last rites to some of the victims. In all, eleven persons were killed (though the newspapers mistakenly reported twelve, initially) and 180 were injured in what has been the worst "L" accident to date. Through the cooperation of several agencies, the site was completely cleared of all wreckage and debris in about twelve hours and normal operations were restored by 6:30am the next morning. The cars involved in the accident were impounded at the Skokie Shops yard, pending investigation of the crash. 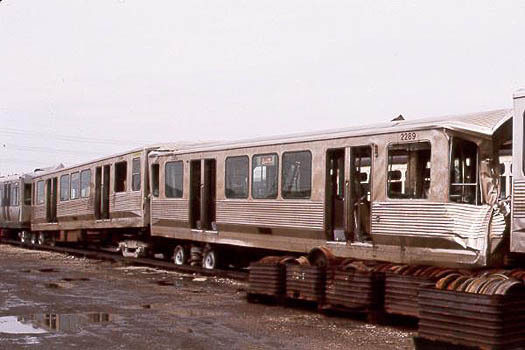 The first four cars, 2000-series unit 2043-2044 and 2200-series unit 2289-2290, were so badly damaged that they were removed from service and eventually scrapped. The rest of the cars were repairable and were eventually returned to service. Stephan Martin, the Lake-Dan Ryan motorman, had a poor safety record including such things as a prior derailment and several violations for reading while in motion. He had four marijuana cigarettes in his shoulder bag, and drug tests showed he had used marijuana, but not other drugs or alcohol. His conductor, who had eaten lunch with him, testified they had not smoked marijuana during lunch. The popular theory of what happened goes like so: the motorman, while approaching the Randolph/Wabash station, got a restrictive signal indication and the alarm in his cab went off. But, making the normal station stop, he inadvertently overrode the signal, which allowed him to proceed. He left the station and proceeded under 15 mph, which prevented the automatic braking from engaging. What happened next is open to speculation. Some say that Martin, who was known to talk to passengers (especially female ones) while motoring, was doing just that while approaching the Ravenswood train ahead and didn't see the impending collision. When his train struck the stopped Ravenswood, it is believed that he either panicked and accidentally applied more power instead of braking or that the sheer force of the impact threw him forward and, as a result of his hand being on the Cineston controller, threw the control forward as well. These exact details cannot and perhaps will never be 100% confirmed. But, as a result of this accident, motorman can no longer proceed on their own "on-sight" against a red signal. A new rule, Rule 6.4, was put in the CTA rule book. This regulation says that when a motorman receives a false red signal, he must call the Control Center to get permission to proceed. A light in the cab labeled "R6.4" lights up and only on permission from control can he proceed at under 15 mph against the signal. This situation is often referred to as "getting an 'R6.4'."